For this week we had a lot to prepare! Familiarise ourselves with The Cherry Orchard by Anton Chekhov. What I picked up from the text: Introduction (pages 1-9) the text begins with Nietzsche’s words “Whoever fights monsters should see to it that in the process he does not himself become a monster. When you look long into the abyss, the abyss also looks back at you.” The abyss in this case is the stage, the great space where audience meets the art. “To look into such an expanse is potentially frightening, especially if, as Nietzsche suggests, it looks back into you. And the stage most definitely returns the gaze. That’s a very scary but romantic idea. For me it means that everything can happen in this encounter and every time we go on the stage or coming to watch a play we are aware of the danger aspect of it and what’s pulls us in. it continues and discuss stage reading. “We don’t quote the arras of that probably hung at the rear of Shakespeare’s stage, we quote his words;” we come to see a play not the hear one, therefor “each and every component of the theatre contributes to the reception and understanding of the drama.” I’ve mentioned that before at the previous posts. If every stage id hunted and everything is remix, every tool we use to create the imaginary world on stage should be significate even if the stage is naked and the performer creating the imaginary world on stage with his/hers own body and presence. Stephan Mallarme is calling to “detheatricalize the theatre”. To strip it from its spectacle aspect of it and distil it to something pure and accurate. Aronson is quoting W.J.T. Mitchell “words and images seem inevitably to become implicated in a war of signs..” and explains “…because vision and sight are not only physiological phenomena but cultural constructs, to discuss (contemplate) the theatrical image would also require an acceptance of certain cultural norms, a step that is not only difficult in a multicultural society, but anathema in a postmodern world”. So what is scenography? It is everything we use to design or create the imaginary world on the stage; how we shape the time, the space, the setting, the characters the voice the body and so on. Every component should support the main theme, the idea. The story and so Richard Wagner’s idea of the Gezemkuntswerk is mentioned in the article as an attempt to overcome this lack of unity. Edward Gordon Craig suggesting that the actor should be replace with Uber-marionette in order to control every aspect of the performance. In my work as a theatre practitioner I’m trying to explore the gesamkutswerk in a more postmodern way. I can’t see myself limiting the way I express ideas on stage to just one form as in life itself. If “…the material world is referenced” than we have to use all the tools we have, combined, to represent the particular thing we want to discuss and not the whole world because that is impossible even with more ‘live’ tools like happening or Agosto Boal method. “Even if everything is stripped away, there is still the stage itself, staring back at the audience”. I think that once the audience accept the suspension of disbelief and looks at the stage as whimsical,non reality place, the stage is charged with the artistic presence and therefor the stage is never naked. “…everything from the space to the text, to the performer, to the audience as elements of scenography.” This is how perception of even the reality around us works, via more than four dimensions with our 6 senses. “First observation: cultural edifices are inimical to change and unresponsive to art. Given the opportunity, the state will always erect such edifices to preserve the status quo, but this will lead to artistic decline.” For me, the worst kind of theatre is a ‘stupid theatre’. The theatre must be a result of investigation, of research of exploring new and more importantly old worlds and fields of theories. Again, everything is a remix and nothing is original the new thing we are obligated to the stages has to be based on understanding the past and using it in new ways. This is for me what art is today. “One goes to such theatre in order to validate experience.” Nothing is uncanny. We use art to express the things we cannot say with words, and if we are not engaging with any core of the humanity than we are not saying anything. The “extradaily time” is what separate the reality world from the imaginary world created for the audience on stage. The extradaily time therefore is the definition of any theatrical action. “Second observation: a theatre that exist to exploit new technology may contribute to popular entertainment, but will have little immediate effect upon dramaturgy.” I didn’t fully understand that. Plays are written to stage, to a stage, and it’s part of the audience perception of what they see as every other element that lays on stage. Also it has equal effect on the general perception as dramaturgy. Technology also allow us to live exist in other time and place and “… it is no longer necessary to go to the concert hall, the museum, the movie house, or even the library in order to consume these products of culture.” Now we have two worlds to live in our world and the cyberspace. A place where we can live forever. Eternity doesn’t exist in the ‘real’ lives of any of us. I object to the idea the article suggest that we live in era of simultaneity. We can’t live in tow moments at once. The other ‘personas’ we grow in the media can live independently but our only existence is the here and now. Beyond that it’s all just cynical stories. “Fourth observation: theatre-in fact, art in general- is shaped not by specific technological developments, but through transformations in consciousness and modes of perception that may. However, be significantly affected by technology. This is the key to understanding the relationship between theatre and technology.” For me this is true. Technology today allows us to expand our range of expression tools we have and explore new ways of shaping this slice of life on date. It can also expand our experience of the performance beyond the amount of time we experience in the theatre. It can begin in some time prior to the actual physical encounter between the performer and the audience and last way after the curtain went down. The postmodern theatre as I experience it today, is coming closer to the true gesamkutswerk and by that coming closer to life itself. The use of mediatise technics and relying on proximity and coincidence transforming the theatre to a place where the mimesis can really happen in some sort of a lab environment. Its challenging to call it coincidence when the artist’s role today, as I see it, to accumulate and almost obsessively collect raw materials that someday, in the right moment, and whenever the last component will come and unite that to one clear work of art. I’ve discussed that in my essay, after Yair Garbuz article about accumulation as a method. The article also mentioning mirrors in that context; “if mirror were part of the set, would we expect it to reflect us-the spectators-or the virtual world that is an implied extension of the setting?” yes, we would and that brings to scenery new questions, semiotics meaning and others. Its stretches the limits and the boundaries between the real life (reality’s time and space) and the imaginary world, artist and audience and art itself. It’s a common perception to compere the stage to a mirror of life itself. (The author is quoting declarations about that from Hamlet and Don Quixote). But who is mimicking who? “We look at the stage and it returns our gaze”. So in many ways to go to the theatre means “risking the loss of self”. 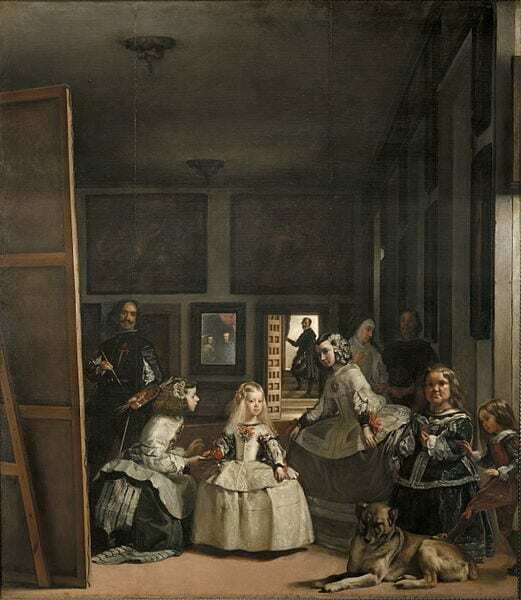 The mirror that Velazquez insert to Las Meninas doesn’t function as a mirror, it’s a painting of a mirror. Is it a metaphorical mirror? Is it ars poetica self-reflection of the artist or on art in general? The article defines the mirror as a hetero-tupia (after Michel Foucault) and a liminal space (after Victor Turner). “ from the standpoint of the mirror I discover my absence from the place where I am since I see myself over there.” The mirror in art and in theatre in particular should be carefully examined. It’s a window that can lead to other worlds the artist can’t necessarily control or aim to. If it’s not used to support the main idea, the meaning or the theme it can disrupts he message. “The mirror effect the stage can and should provide us can be intimidating and can brings this embarrassment that eventually leads to the catharsis. The stage, like the mirror can only exist in relation to the thing it reflects. Therefore the acting space must be distinguished from the audience space. They can’t live in the same space because one reflect on the other and without this reflection aspect the art cannot be happening. The stage should also create a language and a set of rules that would parallel the real world. A sign or a signifier without a meaning behind it cannot exist. The stage is an illustration to life itself. Therefore the theatre is a visual art. It frames time and space. Proxemics: is the theory of the interpersonal proximity. The theory is about the influence of the physical distance between people and how it affects their behaviour and feelings, in a nonverbal communication. The theatre, as a live art, affects people in that way. The presence of the actor and his work in one space and time with the audience affects both the actors and the audience and charges them by eye contact, mood, voice and so on. Kinesics: the study of the body behaviour communication. It’s one part of the many ways we communicate with each other. What makes the physical language universal is the physiologic identity between one person to another. This is the body semiotics. The body is a signifier. The theatre is a certain way of communication, as all art forms, and is made from different components (Kowzan’s table of the 13 sign systems at work in theatrical performance); the spoken word for example. And kinesics, the physical body processes. Semiotics: a chain of references. Kowzan’s table lists the semotizition principle to its primary theatrical components. Semiotics is highlighted in the theatre in situations of iconic identity. Every component on stage can be analysed and understood throw an inner action of semiotics. What we did in class: we discussed semiotics, phenomenology and meta narratives. Then Dr Dobuis gave us a task: to draw the stage of Arthur Miller’s Death of Salesman based on his very specific instructions at the beginning of the play. We all drew very different things. We understood that although we may understand the signs we only understand this essence and we have different ideas on how to embody them. A collis on the stage can be a signifier of the house of the Prozorovs (in Chekhov’s Three Sisters) as a simple fictional signifier, (based on the suspension of disbelief). The house is also a symbolic referent and can direct to out of stage referents; periodical, global and so on. The Prozorovs house also represent of a class the can longer be exist or a cultural and personal immigration. 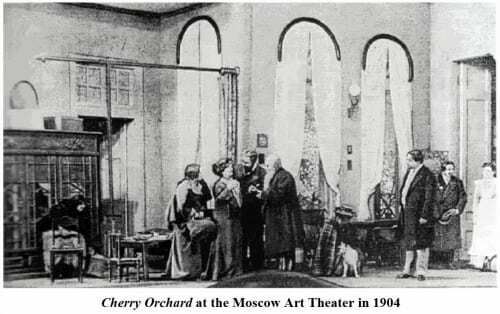 The link bellow leads to an iconic production of the cherry orchard in the Israeli khan theatre. Enjoy!